Multi-what? Yes, multigrain onion rings. 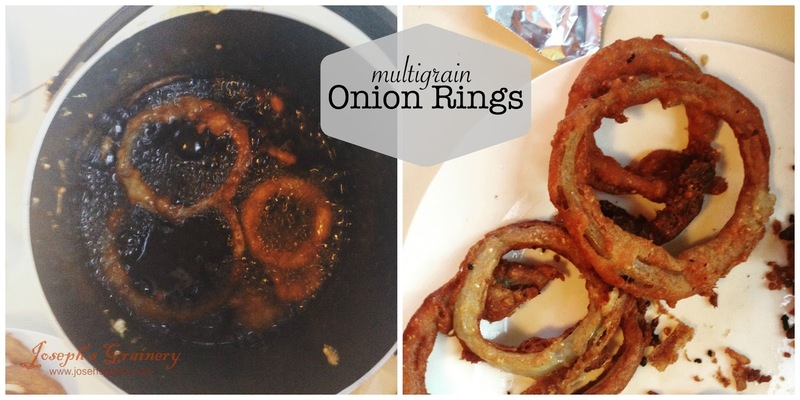 Did you know you could make onion rings using Joseph's Grainery Pancake Mix as the batter? Our whole family pitches in around Joseph's Grainery whenever the opportunity arises, so when when Eric made onion rings using our Multigrain Pancake Mix, we were all excited to taste test for him. We definitely weren't disappointed. The multigrain onion rings were amazing! In a deep fryer or a medium saucepan pour in 1-2 inches of oil (we used olive oil) and heat on medium high. In a bowl, mix the pancake mix, eggs and milk until combined. Let the pancake mix sit for 5 minutes. Slice 2-3 large onions into rings and separate the layers of the onion, so the layers for individual rings. Dip each ring into the batter to coat it. Place the battered onion into the oil and let it cook until it turns a golden brown. Remove and let cool, serve while still warm.